At WPGA, you belong here. Turning to the news this past week, we’re reading and seeing stories of truly troubling behaviour, specifically hazing, in a Toronto school, or even on a professional sports team. Hazing. Abuse. Sexual abuse. It’s horrible, awful, sad stuff. Young people mistreating their teammates, their friends, their peers. Or so they thought. It’s difficult to read; it’s confusing to comprehend. Our thoughts are with all the members of those communities. Without sitting in judgement, we sincerely hope there will be essential reflection and repair and restoration in the months ahead. Reading this kind of news can be genuinely disconcerting and we might find ourselves asking: “Could this sort of thing happen anywhere? Here?” As teachers, school leaders, coaches and parents, this question has surely crossed our minds. If the theoretical answer is: “It’s possible,” then long may the reality be: “No, never.” How do we ensure it is ever thus? How do we cherish the sense of community and of safety that we’ve created? How do we continue to create a culture of respect? Culture. Subculture. Culture is what we strive to intentionally create, what we promote, what we say and how we behave in all of our outward public personas. And we have been extremely deliberate in the design and stewardship of our school’s culture throughout the years, through programming, hiring, assemblies, ceremonies, responsiveness and relationship building. It's what you typically observe and feel over time through your many experiences at the school. Now, a school could also have a subculture, a current that runs underneath culture, winding its way through an organization in smaller pockets and in quieter conversations and interactions—not outwardly professed or pronounced. If there were a subculture, ideally it would be in perfect harmony with our culture, running parallel—that indeed all we strive to be and to create is also how we feel and act in our private personas. Hopefully the pride, enthusiasm and joy we express for all things “Dub Peeg” is as healthy and evident in our inward selves as it is in our outward selves. When this happens a school’s subculture becomes a powerful, pro-social force in strengthening its culture and reinforcing our core values, mission and ways of being. 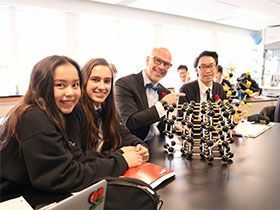 In regularly speaking with students and alumni, we are consistently pleased to learn that our school’s respectful culture is admired, intact, and largely reflected among themselves and evident across their own experiences. Yet we must also be vigilant in ensuring that our students genuinely know what we value and what we expect. Of equal importance, they must also know that each of them has every right to feel valued, respected and safe. And if at any time they ever feel otherwise, it is our sincere hope that they will feel confident and comfortable speaking directly and seeking support from a trusted adult at WPGA: a teacher, counsellor, coach, advisor, administrator, staff member. It is our promise to make the time and the space to support, strategize and find solutions both for and with our students. One can often simultaneously experience a sample of a school’s culture and its subculture in competitive arenas, e.g. sports, debates, academic and creative problem-solving competitions. When you do attend, keep an eye and an ear open for this culture of respect, for ourselves, our teammates, our opposition and all officials. As an example, have you ever noticed that “cheering" and “jeering" can sound similar, or even the same? I mean, the words themselves, when pronounced can sound very much like the other: just say them 10 times fast: "cheering, jeering, cheering, jeering, jeering, cheering." And the sounds in a gym, on a sports field, and perhaps other competition arenas—the actual sounds of many people cheering, or many people jeering, can sound similar. But not quite, not the same. The sounds of the words themselves, the sounds of the acts themselves, and certainly the meaning of both, are not the same. We must continue to be amazing. There is no tolerance or need for hazing. Joining the Wolfpack is a point of pride and our alphas must always welcome the new cubs. At WPGA no one should be belittled, berated or bullied in order to belong. It’s just not the way. Pack-mentality can be powerful and positive when it is “Wolfpack-mentality”! As attributed to Rudyard Kipling, “The strength of the wolf is the pack. And the strength of the pack is the wolf." Go, Wolves! You belong here. On the subject of culture, connection and belonging, below is a spoken word poem written by Malika Agarwal '19, which she performed at the 2018 Gala. All you have to do is say “hey”. I’ve been hearing that word, “hey”, for the last 13 years of my life. Beyond the books I have stacked. It’s really about the Grey Wolves in our pack. than a thin gold foil covering up the truth that we are all the same. from where we all fell off our bikes at the age of 4 and a half. even if we weren't all born in the same place. But we need to realize that some of us need more help than others right now. And sympathetic reassurances over vocab tests...gone wrong. While I do biology homework I learn that fibrinogen clots our blood. It makes the flow, pause and stop, rest a while. This is something we’ve learned to do on our own. Sure, there’s fluidity in our language, and we go with the flow. We happily clot a vein of students with our chatter. We are naturally keen for the pace to slow. Stitched up with effort up just like the fabric of our school. A bit messy around the edges but kind. Always, at our core, we’re kind. A school so tightly knit that you’ll receive “bless you’s” even before you sneeze. Scattered across hallways that feel like sunshine and art projects. But also happiness in hearts. That’s all you have to say. To that person on your left at the bus stop. That person you haven’t talked to in a couple of years. Because everyone needs to know that somebody cares. Change the way that you think. Those people who are suffering? Who don’t have a net to catch them like we do here? Somebody has to show them the good in this world.